The Obama administration has been caught red-handed engaged in software piracy. Computer code used on Healthcare.gov was stolen (and then modified in an effort to conceal the theft) from a UK company called Spry Media. To my best knowledge, this story was broken by WeeklyStandard.com in a blog authored by Jeryl Bier. The computer code that was stolen is called DataTables, and it is exclusively provided under a GPL v2 license which requires anyone who uses the software code to keep the copyright notice visible in the code itself. This allows the original author of the code to receive attribution for creating it. 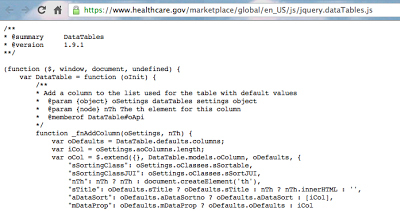 An analysis of the code running Healthcare.gov reveals that the Obamacare development team maliciously removed the copyright notice and credit attributions from the code while copying and using the rest of the code. In the field of journalism, this would be called “plagiarism.” In the field of computer software, it’s called “piracy” according to the U.S. government. Nearly all of the remainder of the script is identical to the Spry Media code, proving beyond any doubt that the Obama administration pirated this code in its construction of the failed website Healthcare.gov. Will DHS now seize Healthcare.gov? The Department of Homeland Security has seized hundreds of other websites that it says were engaged in piracy. Willful copyright infringement is a federal crime that carries penalties for first time offenders of up to five years in federal prison, a $250,000 fine, forfeiture and restitution. Will the developers of Healthcare.gov who pirated the DataTables software from SpryMedia now be sentenced to federal prison? Don’t hold your breath on that one. Prisons aren’t used to lock up actual criminals anymore. They are “work camps” with the sole purpose of locking up black Americans so they can be exploited as a “human resource” of ultra-cheap labor. Yes, the prison labor industry needs more output, and that’s why the entire “war on drugs” is allowed to continue even though it is a complete failure. Sounds like Obamacare, come to think of it: A disastrous program that wastes billions of dollars while enslaving innocent Americans in a system where they will be financially raped for life. Am I the only one who thinks we might be better off if we forced all politicians to trade places with all prison inmates? A video obtained by the Guardian details new software that is capable of gathering vast amounts of information about people from websites like Facebook and Twitter. US defense giant Raytheon has developed a controversial software that uses social networking sites to track your movements, able to predict where a person will be and their future behavior. The program has drawn criticism from civil rights groups. A video obtained exclusively by The Guardian shows how software developed by the US defense contractor Raytheon, can gather vast amounts of personal information from social networking sites such as Facebook, Twitter and Foursquare. Raytheon has admitted that the technology was shared with the US government as part of a joint research and development program in 2010, as part of an effort to build a national security system capable of analyzing trillions of entities from cyberspace. But, the Massachusetts-based company says it has not sold the software, which is called Riot, or Rapid Information Overlay Technology, to any clients. The controversial software allegedly enables access to entire parts of a person’s life, their friends, any pictures of themselves they have posted online and places they have visited charted on a map. In the video it is explained by Brian Urch, Raytheon’s ‘principal investigator’, exactly how the program can be used to track someone down. “We’re going to track down one of our employees,” says Urch. He then proceeds to show, using information gathered from social networking sites, how “Nick” visited Washington National Park and a picture of Nick in the park with a blonde woman. “We know where Nick is going, we know what Nick looks like, now we want to try to predict where he will be in the future,” Urch continues. As Nick regularly uses Foursquare, a phone app that alerts friends to your whereabouts, it was possible for Riot to track the top ten places visited by Nick and the times at which they were visited. It shows that Nick visits a gym every Monday at 6am. “So if you want to get hold of Nick, or maybe get hold of his laptop, you might want to visit the gym at 6am on a Monday,” says Urch. Using public websites for law enforcement is considered legal in most countries, and Riot will be of interest to intelligence and national security agencies. In February last year the FBI requested that it wanted to develop ways of mining social media sites for monitoring “bad actors or groups”. This has prompted concern from civil liberties groups about online privacy. Ginger McCall, an attorney at the Washington-based Electronic Privacy Information Center, said Riot raised concerns about how an individual’s data could be collected covertly without oversight or regulation. “Users may be posting information that they believe will be viewed only by their friends, but instead it is being used by government officials or pulled in by data collection services like the Riot search,” McCall told The Guardian. But Raytheon defended its product and in an email to the Guardian Jared Adams, a spokesman for the company’s intelligence and information systems department, said it would help to meet the US’s rapidly changing security needs.He also highlighted that it does not analyze personally identifiable information, such as bank details or social security numbers. In December Raytheon indicated that Riot would be part of a patent the company is pursuing for a system designed to gather data from social networking sites and blogs to identify if someone is a national security risk. Russia’s Foreign Intelligence Service (SVR) has ordered three systems worth about US$1 million that will automatically spread information on the Internet. Online Event Software: How to Choose the Right One? Prison Planet.com » Are Gun Rights The Next Target Of Corporate Censorship? All Evidence Shows #GOPTaxScam Is Horrible. Only Question: Can It Be Stopped? ﻿F-35: Can anything else go wrong with Britain’s fighter jet order? Will the Feds Ruin Self-Driving Cars? Can a Heart Be Hacked? Sick of SJW Tech Giants?